Curtains and blinds are not just functional practical items, they are the ultimate window dressing. Viewing them as an accessory to improve a room, shielding light, casting shadows and adding opulence, makes them a talking point. So why choose curtains or blinds? What’s the advantage of either? The simple answer is, it depends on what you are looking for. Curtains can be used to frame a window, add warmth to a room and add texture and movement where none exists. If they are heavily draped, or sheer and transparent, they can add depth to any room. Rich hues can update an otherwise sparse and dull room. They are easy to update if you want to change around your interiors in a hurry. Matching your curtains with some cushions and a throw in your sitting room can make all the difference. Adding billowing light with white or soft cream transparent drapes to a bedroom can bring in more light. If you view your choice of window dressing by the ability they have to control light, then blinds are the best option for you. The enduring benefit is the ability to create or make light disappear in an instant. Another advantage is the ability to block out the glare of the sun and the heat attributed to it. A big issue for any interiors that are subject to the glare of the sun, is colour fading over time. 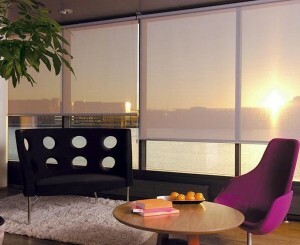 By investing in good blinds in the beginning, you will get more longevity from your interiors. There are so many styles, fabrics and colours to choose from. Recent trends lean towards more natural and sustainable fabrics such as linen, cotton and bamboo, plus collections made from recycled fibers and new generation pvc free polyesters. When investing in curtains, make sure and think about adding a pelmet to provide the best light protection. Pelmets add an extra luxury finish to any set of curtains, and draw the eye as a feature point. Need something that will make a statement? Swags and tails are the opulent choice to add an element of grandeur to your room. Endless choices of trim make them ideal for the ultimate customisation and an excellent choice to match trimmings to the rest of your interiors. Roller blinds are a great solution for achieving the perfect light, with minimal impact on design. They tend to feature as more practical options in a less formal family style environment. In contrast, Roman blinds create a more chic and sophisticated look. Venetian blinds come in wood or aluminium. Wood is clean, modern and flexible. 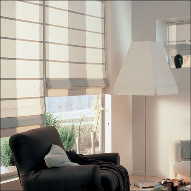 Aluminium allows you to slant the blinds giving more options in flexibility. They can be tilted to capture the light and the breeze. If you have a large segment of window to cover such as a French door, try panel glides. Always take into consideration how much maintenance goes into your choice of curtains or blinds as there is no point investing in good quality solutions if you don’t plan to take care of them. Moisture, sun and pollutants in the air damage curtains, but fabric handling does the biggest damage of all. Make sure you purchase curtains with a good quality lining to reduce fading. Buy a flick stick or wand to reduce handling the fabric. If washing requirements state they need professional cleaning, then do follow the instructions. With blinds, it is important to dust regularly. Most do not respond very well to chemical solvents or water. Where you see a stain, spot clean where necessary. Consider using your vacuum cleaner with a soft brush attachment to keep roman and roller blinds clean. Just make sure not to stretch the fabric. Venetian blinds do well with a regular wipe of a microfiber cloth. Our top tip is to make your life a whole lot easier and invest in motorisation. Whether it is remote control operated or wall mounted, there are multiple options out there that make it highly convenient. Share the post "A Buyers Guide to Curtains and Blinds"